With streaming platforms like Kafka, data arguably never rests. As data flows through and across data sources and destinations, it’s possible that sensitive data goes unnoticed and potentially gets in the hands of the wrong people or land in the wrong applications. In-stream data protection helps ensure that any data flowing through Kafka is protected from unwanted use and exposure. Apache Kafka has become a popular choice for stream processing due to its throughput, availability guarantees and open source distribution. However, it also comes with complexity, and many enterprises struggle to get productive quickly as they attempt to connect Kafka to a diversity of data sources and destination platforms. -How to design any-to-any batch and streaming pipelines into and out of Kafka. -How to monitor end-to-end dataflows through Kafka. -How to operate continuous data movement with agility as data sources and architecture evolve. Every organization wants to know more about its customers. More data can lead to a more comprehensive Customer 360 view—but only if all that data can be captured, managed, and kept safe from unauthorized use. Companies today are forced to piece together partial views of customer behavior, managing to the limitations of their systems and not to their analytic goals. When data lives in silos it can create gaps in analytic outputs and poor visibility for business intelligence. StreamSets built a DataOps platform to help manage complex data flows into analytics environments with pre-built connections for popular customer data systems. Join 451’s research director Sheryl Kingstone to discuss how DataOps is fueling digital transformation. -How to build Customer 360 in a scalable way to capture customer data—across all an enterprise’s systems, securely and in real-time. -How to deliver a unified, complete picture of the organization’s interactions with its customers. -Challenges that make it difficult to adequately protect customer data, including personally identifiable information (PII). Cloud Data Warehouses are on the rise. As companies aim to make analytics pervasive across their organization, cloud data warehouses and data marts became a logical solution for delivering a familiar analytics experience but without the constraints of managing large DW infrastructure. Cloud Data Warehouses help reduce management and infrastructure costs, offload maintenance and uptime responsibilities, and allow users to simply load data and run queries instead of managing databases. However, migrating and streaming data to these new cloud managed services remains a freshman effort with many tools offering only simple ingestion functionality and limited data destinations. StreamSets has built an advanced integration with popular cloud Sw solutions like Snowflake, one of the world’s most popular cloud data warehouses. This level of integration provides fast synchronous and asynchronous ingest, multi-table uploads, and data drift compensation. StreamSets Control Hub helps users then manage a variety of pipelines, on-premise; across public clouds and cloud services. -Take a look at common usage patterns for Cloud Data Warehousing. -Understand the core functionality of the Snowflake connector. -Get information on the installation and operation of the new tool. When streaming data meets machine learning and advanced analytics, the innovation possibilities can be endless. Operationalization of data movement in a hybrid cloud architecture is key to making your technology investments deliver on their promises. Without it comes frustrated developers, failed projects and technology disillusionment. 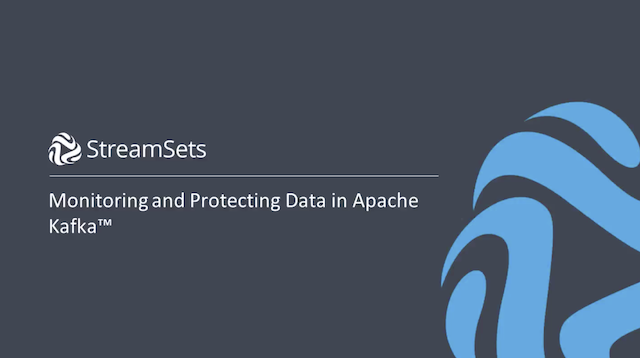 Join Doug Cutting, Apache Hadoop creator and Chief Architect at Cloudera, and Arvind Prabhakar, co-founder and CTO at StreamSets as they discuss how to use DataOps to avoid common pitfalls associated with adopting modern analytics platforms. According to research firm Gartner, at least 75% of large and global organizations will implement a multicloud-capable hybrid integration platform by 2021. Join StreamSets Head of Product Management, Kirit Basu, and Head of Product Marketing, Clarke Patterson as they discuss how StreamSets customers are taking a DataOps approach to hybrid-cloud integration. We explore how Fortune 500 customers are using StreamSets to streamline Apache Kafka and Data Lake projects using principles adopted from DevOps. DataOps borrows concepts from agile development to streamline the process of building, deploying and operating dataflow pipelines at scale. Putting DataOps into action requires not only the right technology, but more broadly a thoughtful approach to align the people and the process behind such an initiative. Eckerson Group research analyst Julian Ereth join StreamSets' Co-Founder and CTO, Arvind Prabhakar to explore the emerging trend of DataOps. The convergence of streaming data platforms with cyber security solutions presents real opportunity for combating and predicting future threats. Join StreamSets and Optiv as we discuss common use cases and architectural patterns used by leading Fortune 500 organizations to modernize their cyber architecture. Enterprises are now faced with wrangling massive volumes of complex, streaming data from a variety of different sources, a new paradigm known as extreme data. However, the traditional data integration model that’s based on structured batch data and stable data movement patterns makes it difficult to analyze extreme data in real-time. Join Matt Hawkins, Principal Solutions Architect at Kinetica and Mark Brooks, Solution Engineer at StreamSets as they share how innovative organizations are modernizing their data stacks with StreamSets and Kinetica to enable faster data movement and analysis. Edge computing and the Internet of Things bring great promise, but often just getting data from the edge requires moving mountains. -How to make edge data ingestion and analytics easier using StreamSets Data Collector edge, an ultralight, platform independent and small-footprint Open Source solution for streaming data from resource-constrained sensors and personal devices (like medical equipment or smartphones) to Apache Kafka, Amazon Kinesis and many others. -We'll provide an overview of the SDC Edge main features, supported protocols and available processors for data transformation, insights on how it solves some challenges of traditional approaches to data ingestion, pipeline design basics, a walk-through some practical applications (Android devices and Raspberry Pi) and its integration with other technologies such as StreamSets Data Collector, Apache Kafka, and more. Modern data infrastructures are fed by vast volumes of data, streamed from an ever-changing variety of sources. Standard practice has been to store the data as ingested and force data cleaning onto each consuming application. This approach saddles data scientists and analysts with substantial work, creates delays getting to insights and makes real-time or near-time analysis practically impossible. Cox Automotive comprises more than 25 companies dealing with different aspects of the car ownership lifecycle, with data as the common language they all share. The challenge for Cox Automotive was to create an efficient engine for the timely and trustworthy ingest of data capability for an unknown but large number of data assets from practically any source. Working with StreamSets, they are populating a data lake to democratize data, allowing analysts easy access to data from other companies and producing new data assets unique to the industry. -Took on the challenge of ingesting data at enterprise scale and the initial efficiency and data consistency struggles they faced. -Created a self-service data exchange for their companies based on an architecture that decoupled data acquisition from ingestion. -Reduced data availability from weeks to hours and developer time by 90%. GlaxoSmithKline is a pharmaceutical company that has pioneered a transformation of its R&D data and analytics infrastructure. Creating a new drug can take anywhere from 8 years to 20 years for a pharmaceutical company and GSK aimed to shorten that development time by giving over 8,000 scientists access to trial data. GSK is focused on bringing siloed data together into a primary data and information platform where users across the enterprise can consume all the data in different ways. In order to deliver these capabilities GSK has set up a Center of Excellence (COE) around data delivery and dataops. The team is responsible for dynamically scaling its data flows to meet the demands of new data sources. They have evolved the data practices over time to automate aspects of data acquisition and delivery utilizing bot-driven pipelines. VP of Strategy at GSK Chuck Smith joins us for a look at the solution and talks about the future. According to the 2018 Apache Kafka Report, 94% of organizations plan to deploy new applications or systems using Kafka this year. At the same time, 77% of those same organizations say that staffing Kafka projects has been somewhat or extremely challenging. In this multi-part webinar series, StreamSets will take learnings from our customers and share practical tips for making headway with Kafka. Each session will discuss common challenges and provide step-by-step details for how to avoid them. By the end of the series you'll have many more tools at your disposal for ensuring your Kafka project is a success. Kafka and Tensorflow can be used together to build comprehensive machine learning solutions on streaming data. Unfortunately, both can become black boxes and it can be difficult to understand what's happening as pipelines are running. In this talk we'll explore how StreamSets can be used to build robust machine learning pipelines with Kafka. According to research firm Gartner, at least 75% of large and global organizations will implement a multicloud-capable hybrid integration platform by 2021. As businesses continue to embrace digital transformation, moving toward self service analytics and cloud analytics executed on big data, a more agile solution for these workloads is needed. StreamSets applies DevOps practices to data management and data integration to reduce the cycle time of data analytics with a focus on automation, collaboration and monitoring. DataOps is essential for a data landscape marked by complexity of data architecture with accelerating change. Join StreamSets Head of Product Management, Kirit Basu, and Head of Product Marketing, Clarke Patterson as they discuss how StreamSets customers are taking a DataOps approach to hybrid-cloud integration. We'll explore how Fortune 500 customers are using StreamSets to streamline Apache Kafka and Data Lake projects using principles adopted from DevOps. The StreamSets DataOps platform enables companies to build, execute, operate and protect batch and streaming dataflows. It is powered by StreamSets Data Collector, award-winning open source software with approximately 2,000,000 downloads to date from thousands of companies. The commercial StreamSets Control Hub is the platform's cloud-native control plane through which enterprises design, monitor and manage complex data movement that is executed by multiple Data Collectors. Unique Intelligent Pipeline technology automatically inspects the data in motion, detecting unexpected changes, errors and sensitive data in-stream. Global 2000 customers use StreamSets for data lake ingestion, Apache Kafka enablement, cybersecurity, IoT, customer 360, GDPR compliance and more. In 2017, the company tripled its customer count and quadrupled revenues.